This site contains affiliate links that benefit my family if you purchase through them. Read my full disclosure here. We’ve been studying the Civil War lately. Here are some of the resources we’ve used. My boys are ages nine to sixteen so the resources span a wide age range. War is obviously a violent time in history and the Civil War especially so. The casualties caused by the Civil War easily outrank any other war that America has been part of. However, for younger children, you may wish to shield them from some of the harsher aspects of the war. For this reason, I’ve tried to pick out resources that expose them to this period of our history without burdening them. In Shades of Gray, young Will page is sent to live with his uncle after the Civil War. The war may be over, but Willie still harbors resentment against the North whom he blames for the loss of his entire family. He looks at his Uncle, who refused to fight for the Confederacy, as a coward and a traitor. As he comes to know his uncle, Willie realizes that true courage comes in many forms. This would make a great read-aloud. Behind Rebel Lines is the story of a young woman who disguised herself as a man so she could help fight in the Civil War. She fools both the Union army and the Confederates as she takes on the dangerous job of spying on the South. We haven’t read this book yet, but it is recommended by Heart of Dakota (the homeschool curriculum we use). The only caution they have listed is this: A derogatory term is used in reference to Emma’s supposed ethnicity once in the book. Escape by Night would make a great read-aloud for the younger crowd. In it, Tommy, a young boy from the South, needs to make a difficult decision when he finds a wounded Yankee soldier. This book would also make a good reader for children who are beginning to read chapter books. Some children might find the first chapter a bit gory, so you might want to preview if you have an especially sensitive child. In Spy in the Sky, children will learn about the unique role hot air balloons played in the war. This would be another good book for a young reader. It includes mild peril, but I don’t remember any violence, so it would be especially good for a sensitive reader. I have not personally read Rifles for Watie, but it was assigned reading for my 16-year-old’s history curriculum this year. (We use Heart of Dakota and I generally trust their recommendations.) They do have some cautions concerning brutality and violent derogatory talk, but I find they often err on the side of safety with their cautions. This book is for slightly older readers than the others mentioned. And now we come to one of my favorite history resources! Through the years, our boys have enjoyed Your Story Hour albums. These are dramatized audio stories about real people and events. I grew up listening to these stories and remember many of them clearly. They are a great way to learn about history. I recommend any of their albums. And I just found out lately the albums are available on Amazon as Audible Audio downloads at a discounted price! I can’t think of a better use for Audible credits if you have a subscription. And if you don’t have one, this would be a great use for the two free audiobooks you receive when you sign up! This album is not completely about the Civil War but contains many stories about this time period including a four-part series on the life of Robert E. Lee and The Great Locomotive Chase, an exciting two-part series of an attempt by Union Soldiers to capture a Confederate train. Sojourner Truth: (2 parts) The story of a slave girl who becomes an advocate for woman’s rights and black rights. Lucretia Mott: The story of a Quaker girl who becomes a defender of human rights. A Mother’s Heart: During the civil war Willie Albright is wounded and behind enemy lines, but his mother refuses to leave him there alone. Asleep on Duty: Ben Allen goes to sleep on duty during the Civil War. His sister appeals to President Lincoln for mercy. The Great Locomotive Chase is a video about an attempt made by some Union soldiers to destroy the Confederate railroad system. Our boys really enjoyed this video and it led us on a search for more information about this venture. Our boys really enjoyed this video and it led us on a search for more information about this venture. Don’t you love it when fictional resources lead you to dig deeper to find out what’s true and what’s fiction? We were surprised to find a book on Amazon that was actually written by William Pittenger, the man portrayed as the main character in the video. The book is called Daring and Suffering: A History of the Great Railroad Adventure and is free for Kindle. My boys enjoyed seeing how the movie differed from the book. *The video has a fist-fight toward the end and uses the phrase “d*mn Yankee” a few times. We’ve also been enjoying this printable Civil War Game that I made (pictured at the bottom of the graphic below). It has questions based on the chief events and figures of the Civil War and is a great way to learn while having fun. It’s available here along with a lot of other great educational games. I hope you’ve found something helpful here! I know I’ve probably missed a lot of great resources on the Civil War. What are some of your favorites? We’ve read several of those books. I was going to tell you about The Great Locomotive Chase if you hadn’t already come across it; we have it and have watched it several times, although we usually skip the fight in the prison at the end when the younger ones are watching. I’m definitely going to get the book by William Pittenger; one of my boys will want to read it. I hope your son enjoys it. I found it fascinating to find a book that was actually written by one of the raiders. Thanks for visiting! Such a wonderful and thoughtful list! Also love the World War II list. 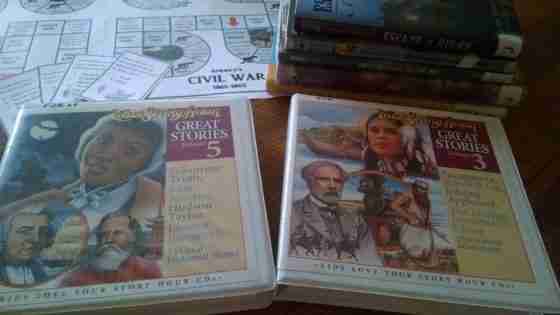 My family of four kids (14 to 8) loves read alouds, especially when they go with our history studies! Do you have any WWI recommendations? Or the Great Depression? I’ve tried searching your blog but haven’t found an entry. Thank you for sharing your experiences and recommendations! Thank you! At the moment I can’t think of any except War Horse for WWI. I’ll give it some thought, though.